Since the late 1990's we at the International Trauma Studies Program have been exploring methods of empowering communities to design and implement their own responses to catastrophes, particularly those that provide contexts that mobilize people toward recovery rather than resignation. Theater Arts Against Political Violence is a model of social theater as a post trauma intervention that draws on concepts from the fields of trauma and performance studies. Of particular interest is the creation of public sites for witnessing, the process of artistic representation of trauma, the transformative power of performance with audiences, and community reflection and dialogue. TAAPV has worked collaboratively with Refugee communities in New York, in post-War Kosovo, and with the post 9/11 Lower Manhattan community. One recent Friday afternoon, a group of three Chilean survivors of torture, two mental health professionals experienced in trauma and the arts, a journalist from the New York Times and a company of theater artists came together in a former classroom turned theater space. The afternoon began with the director leading the actors through warm-up exercises; the Chileans, therapists, and journalist looked on in silence,. The actors, themselves drawn from different countries and cultures, were divided into pairs and at a signal from their director, one member of each pair was blindfolded and led about the room by the other. The were led up to walls, under and over tables, fast, slow, crawling, running. Then the blindfolded one, and the leader changed places and the scene was repeated. Afterwards, the actors continued with physical exercises, portraying colors with their bodies and voices, then animals, then people with the characteristics of the colors and the animals. The exercises ended and attention was turned to the survivors who had come to share their stories with the performers. They had been told that these theater artists were attempting to represent stories of human rights abuses artistically. The eldest of the three, who had been "disappeared" (in anonymous blindfolded solitary confinement) for a year and in prison for three years, began. He spoke, via a translator, of his doubts that his experience could be reflected theatrically, of his doubts that anyone could understand what he had been through. 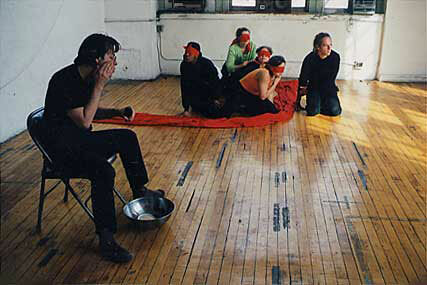 But when he saw the blindfold exercise he had been reminded of the months he had spent blindfolded in prison, and he realized that it was possible, that what he remembered so privately, might be represented on a stage, inhabited by actors, and have a purpose beyond his individual experience. First one, then the others, told their stories, some for the first time; the actors, directors, playwright, asking gentle questions, looking for the detail, the word or image that might be rendered theatrically. Such scenes go on each week in that Manhattan classroom. Only the guests change. Survivors from different countries and experiences share their stories and listen to othersí. Human rights workers in the field, people who work with refugees, artists, photographers, trauma therapists and researchers have stories to tell, or come to watch and listen. Journalists enter the forum to learn, in a creative, safe and intimate setting, what survivors have to tell, what they need to have told, what the obligations are of those that hear and attempt to represent their stories. After a break, the actors went to work. A process of theatrical transformation began. The artists did not attempt to theatricalize the stories told that day. A process of artistic gestation is required. The director and playwright will develop exercises and improvisations from the material. Instead the company works on material inspired by the stories of previous weeks: the story of a tortured pregnant woman is presented from the point of view of the foetus; a scene is created in which a refugee is told that his story of trauma is not gruesome enough to get him asylum but someone can sell him a better story for $200; a childrenís song, taught by a Tibetan refugee, is rehearsed, the lyrics of which would bring on imprisonment and torture, were they sung in Tibet. The Chileans will be invited back to see the images and scenes their stories inspired; perhaps they will offer comments or corrections, perhaps they will tell additional stories. Hopefully, both the survivors and the artists will discover that human trauma and degradation need not be hidden, but might find representation and purpose as a source of art, witness, education, and healing. Theater Arts Against Political Violence aims to respond to the traumatic results of political violence with the healing force of creative art. We have found that the processes of theatrical experimentation and performance derived from the experiences of survivors of political violence and human rights activists provide access to a unique combination of communication, witnessing, creative transformation, documentation, storytelling and education. 1. Creative expression, communication, and witnessing. TAAPV provides a forum for theater artists, survivors and field workers to create and recreate experiences, tell stories, share, validate and transform their experience. Our aim is to find the human truth in even the most inhuman and frightening experience, expressed as part of a shared creative process. Theater arts, such as improvisation, movement, storytelling, gesture, and song, provide a refuge and forum for self revelation and healing for people who most often have been able to tell their stories only furtively, to a chosen few with similar experiences, or in court, or in asylum hearings, or not at all. 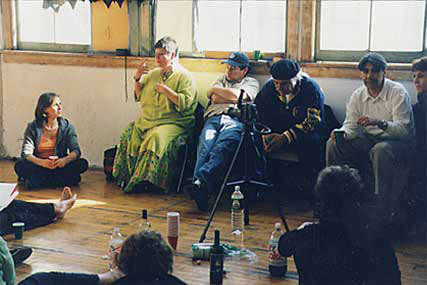 Survivors of trauma crave an environment in which they may safely tell their story; field workers require hands on experience, education and training in how to listen and intervene; theater artists are expert at finding the humanity and the transformative artistic possibilities in even the worst of human experience. Part refuge, part classroom, part performance space, Theater Arts Against Political Violence responds to the trauma of historical truth with the healing force of artistic truth.